To say Kingdom Hearts has a reputation would be an understatement. In 2002 when the series debuted, it was a gaga mashup of Final Fantasy and Disney in an era where crossovers were not too common. Seeing all its characters interact, like Squall and Yuffie chatting merrily with famous faces of Walt Disney history, was bizarre even then. Perhaps it's less weird now though, where crossovers run aplenty across media. Now, with the long-anticipated full-blown return of the series with Kingdom Hearts 3, the Final Fantasy aspect has nearly vanished, save for a friendly Moogle shopkeeper. But Kingdom Hearts doesn't really need it anymore. It has 10 games worth of its own lore and original characters to reckon with. In Kingdom Hearts 3, you still play primarily as Sora, a teenager filled with boundless joy no matter what the omnipresent darkness throws at him. Disney characters Donald and Goofy still quack and woof in combat at his side. 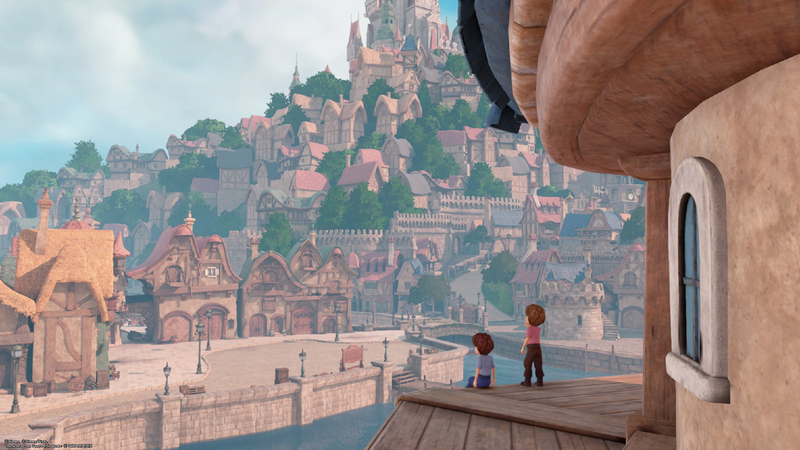 The big themes of the series remain touching and familiar, with sights set on humanity and friendship amidst the Disney-infused JRPG drama. Kingdom Hearts 3 picks up after the events of the Nintendo 3DS game Dream Drop Distance, wherein Sora failed his Mark of Mastery exam to become a Keyblade Master. Now, Sora's off adventuring in pursuit of attaining a skill he desperately needs if he is to become one, like his childhood best friend Riku and Donald and Goofy's king, Mickey. Sora needs the power of waking, which he's not even sure he knows what it means. Meanwhile Riku and Mickey, with their stylish matching outfits, are on their own mission to save Aqua, one of the three heroes from the prequel Birth By Sleep who has found herself trapped in the perilous Realm of Darkness for well over a decade. Together, everyone's end goal is to form seven "Guardians of Light" in their pursuit to take down the series' Big Bad, Xehanort—an old man who is trying to rule the universe and is close to forging an all-powerful legendary keyblade where he'll be able to do just that. You know how old people get! Remedying something that was a big problem in Kingdom Hearts 2, Kingdom Hearts 3 knows how to both hold the hands of players not familiar with the past 17 years of the series, as well as respect the knowledge of diehards. There's a good mix of exposition that breaks down the events of the series comprehensively (thanks to some characters also being in the dark, like casual players themselves), and of smart foreshadowing for the players who do know what's going on and might already have fan theories cooked up. Kingdom Hearts 3 is the sort of game for all fans, both casual and the opposite. Kingdom Hearts is the most sterling example of an oft-ignored era of JRPGs: the PlayStation 2 generation. There is a certain je ne sais quoi about JRPGs from the PS2. They had lofty ambitions and hardly the glue to hold it all together. They were unshackled from simply being impressive due to the first PlayStation's polygon-enabling hardware, now free to let the weird out. It was visible within the likes of Okage: Shadow King's Tim Burton vibes, Shin Megami Tensei: Nocturne's striking art direction, and Dark Cloud 2's anything-goes freedom. Among so many oddball divergences in JRPGs, Kingdom Hearts led the pack with its oddities that only grew stranger with each entry, before it spanned almost every console you could imagine. In Kingdom Hearts 3, you see the DNA of the PS2 generation of JRPGs everywhere. In its convoluted plotting (which even becomes the subject of some welcome self-aware humor); in its world design; in its whatever-works attitude toward action combat. Heck, even the overt hopefulness of its emotional beats feel alien to the dour tone of most modern big budget video games. And don't worry, all those moments that have been 17 years in the making get big payoffs—no game or stray thread is left without some sort of nod. (Except for our Final Fantasy friends living in Radiant Garden, who are conspicuously absent from the plot.) Kingdom Hearts 3 is an all or nothing sort of game. I loved every second of it. I've often described Kingdom Hearts 2 as the sort of game where you hit "X" a lot, and eventually win after 20-something hours. While Kingdom Hearts 3 leans closer to that than the first game in the series, I wouldn't categorize it as a mash "X" to win game. The action-RPG part of Kingdom Hearts really aligns with one word only: chaos. It's like showing up to the rich kid at your school's giant Disney themed party where there is cacophonous absurdity flying in every direction. At its best, it rules. At its worst, it's grating. In past entries, fighting with the auto camera was pretty much half the battle. All throughout my time playing the Kingdom Hearts series, the only time I've felt like I enjoyed playing it was with the first Kingdom Hearts and with its prequel, Birth By Sleep. Those two may not hold up quite as well now, but Kingdom Hearts 3 addresses the series' biggest problem in terms of its combat: variety. 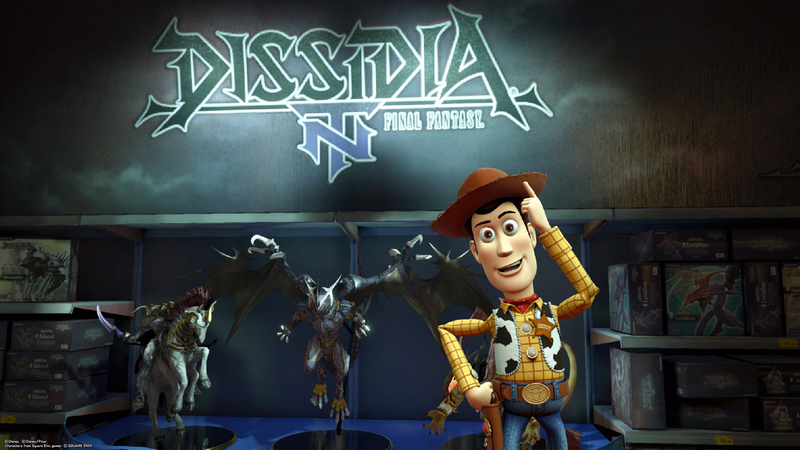 In Kingdom Hearts 3, Sora faces a medley of Heartless, Unversed, and Nobody enemy types throughout its nine-ish mostly Disney-related worlds—down from the 13 in Kingdom Hearts and the 15 in Kingdom Hearts 2. You face exhilarating bosses across areas too, including an impressive final act. The anarchic combat in Kingdom Hearts 3 is, at last, manageable. You can even change the camera to manual, making fights no longer annoying. Sora has an impressive arsenal at his behest too, with the usual magic abilities and keyblades. Now he can equip three keyblades, cycling through when needed with the tap of the d-pad. My go-to was having a strength-focused keyblade, a balanced one, and a magic one. All throughout, I rotated keyblades in and out of my regular use because, in the best change of all, they all feel incredibly unique. In addition, you can level them up through synthesizing (the Kingdom Hearts series' long-running crafting system), making every keyblade equally worthwhile. Formchanges are also joined by other abilities: Shotlocks, Links, Attractions, and Team Attacks. Shotlocks are a targeting system where Sora can lock onto multiple enemies before unleashing an attack, and the move depends on what keyblade he has equipped. Links are Kingdom Hearts 3's version of Summons, and are tethered to the fourth slot on your mini menu. Attractions are the weakest new addition, wherein Sora, Donald, and Goofy hop into a neon-lit theme park ride and sluggishly move around while enacting a special ability until a timer runs out. With Kingdom Hearts 3's fast-paced action, moving slowly or going stationary (as is the case with the carousel or pirate ship attractions) is just a nuisance and not worth the flashiness, so I usually ignored them. 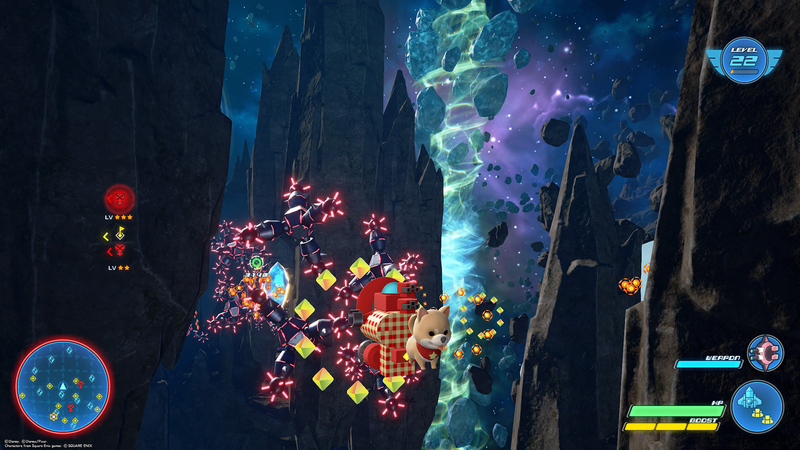 Team Attacks, joint special attacks where Sora teams up with a party member to pull off a unique move, build up with similar meters as the above, but are far more useful than Attractions. It's the worlds themselves where the PS2 heritage feels the most apparent. The environments are bigger than ever before, and mostly gone are the tedious loading screens; though long cutscenes remain sliced in between. There are also fewer worlds than most past entries, and instead the focus seems to be narrowed on widening the scope of each world. Still some worlds, like past games, fall flat. Monstropolis of Monsters Inc. fame is largely just a bunch of boring hallways and factory rooms; the world of Olympus from Hercules is a weak start to everything as the opening locale, and has a bit of a "been there, done that" vibe for those who have played more than a couple games in the series. There are still some excellent wonders though. Big Hero 6's world gives you the vastness of San Fransokyo to run up skyscrapers in, whether you prefer to be a hero by day or night. The Kingdom of Corona, for its simple forested scenery, also bears one of the cutest towns to explore. It's filled with NPCs—something that feels refreshingly new for Kingdom Hearts. The Caribbean feels like the developers were really into Assassin's Creed 4: Black Flag, and decided to craft a whole little sea for Sora and company to sail across and explore in homage—both on islands and underwater. Despite my disappointment at Kingdom Hearts 3's overreliance on modern Disney properties, the larger scope of the individual worlds has been a lot more welcome. Finally, there's more to do aside from mindless grinding in preparation for the notoriously brutal secret bosses. Some worlds have small side quests, like helping a kid find some toys across a city. Or you can explore places in search of hidden Mickey head-shaped emblems, which are anything from etchings in walls to rock formations. For this, Sora utilizes his trusty new Gummiphone, which he initially interacts with like an old man confused by technology. With the phone, Sora can now take pictures including, best of all, selfies. One of my favorite new things to do in Kingdom Hearts 3 was take selfies—sometimes even in the midst of battle like the glorious idiot I am. 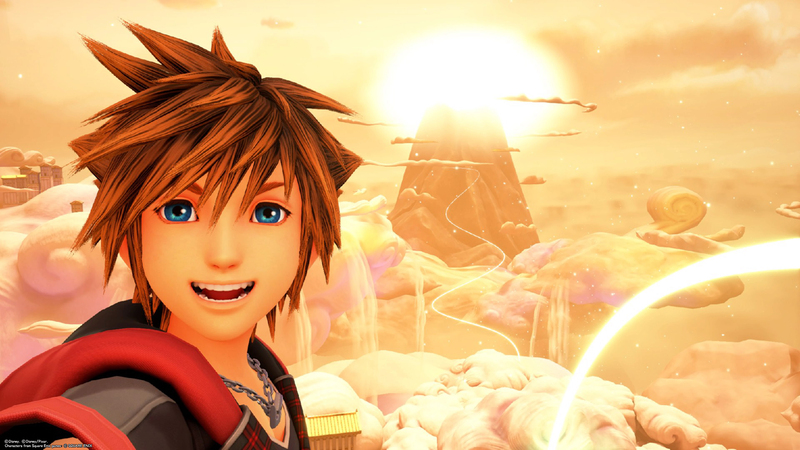 Sora's always in a good mood, so why the heck wouldn't he take selfies whenever he felt like it? As our resident Disney tourist, giving Sora a smartphone is one of the smartest new additions. On his phone, he can also play an assortment of Game & Watch-esque minigames, all based on classic Mickey Mouse cartoons. You collect these games in treasure chests across worlds, from QR codes on miscellaneous posters, and elsewhere. 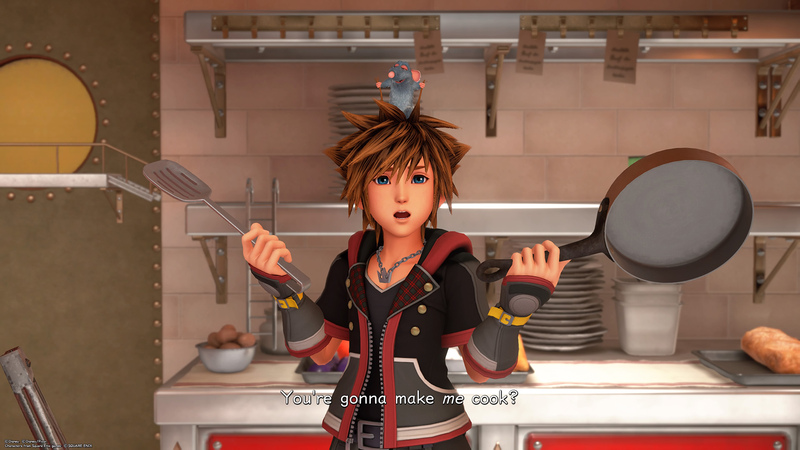 There's even a new cooking system that has its own new minigame, where Remy from Ratatouille tugs on Sora's hair as he performs micro-interactions that reminded me of the long-forgotten Cooking Mama series. (Sorry for breaking so many eggs, Remy.) By eating meals, Sora and his party get timed stat bonuses. The Gummi Ship (hey, stop your groaning!) has also been reworked massively. Designed by the Einhander series director and members of his staff, Gummi Ship travel is a lot better now. With the new system, you have a wide open sliver of space to fly around. You collect things, find treasure, and if you see a Heartless ship in the distance, can initiate a scored battle. If you don't want to fight, all you have to do is ignore the ships and sail straight onwards to Planet Whatever. Finally, Gummi Ships are good. This is even the first Kingdom Hearts game where I actually designed my own ship too. Under the weight of modern releases, some of Kingdom Hearts 3's embellishments wear thin. 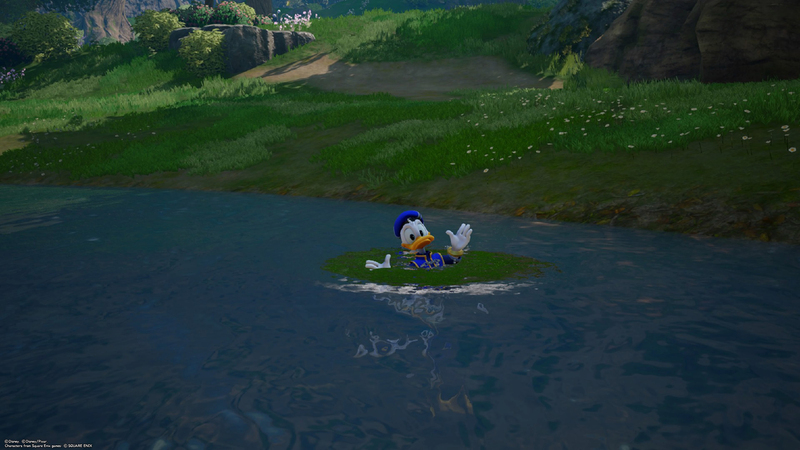 At first, Donald and Goofy calling things out as we walked around was endearing, but after the hundredth time Donald quacked, "This could be a good spot to find some ingredients," I wanted to smack him upside the head with my keyblade. Combat may be more lively and fun, but overall the game was still quite easy on Normal mode—I only died once my entire 30 hours with the main story, and that's with exploring and taking my time. (I imagine once I start pursuing secret bosses—a mainstay challenge in the series—I'll be dying way more.) The cutscenes, too, are very, very frequent in what feels a tad outdated, pacing-wise. Kingdom Hearts 3 feels like a relic. Even with fresh and newer Disney entries at the forefront, there is something classic feeling about Kingdom Hearts 3. For all the new it tosses in, the old-fashioned PS2 design of giant battle arenas with wave-spawning enemies rears up again. It's visible even in how much bigger the environments have ballooned up to, wherein treasure chests have remained just as small as they've always been; only now they look itty bitty and hard to see in the distance. The PS2 generation of JRPGs may be a criminally ignored one, but with Kingdom Hearts 3, the era's ridiculous anything-goes sensibilities get to rise again. It may feel old in more than one way, but it's something that felt comfortable to me while playing it. So many modern JRPGs look only ahead or get too trapped in the past, but Kingdom Hearts 3 is comfortable in straddling both lines; moving onward where the series needs it, but hanging back in ways that would make it feel untrue to the system that birthed it. It's a PS2 game with better combat design, more to do, and best of all, its PS2-styled character models looking incredible in HD. That spiky hair has never looked better. Sora's keyblade has never shown brighter. Those crowd enemy physics have never been more astounding—occasional frame rate hitches be damned. Kingdom Hearts 3 may feel like a game of yester-decade sometimes, but that's what makes it truly memorable in 2019. 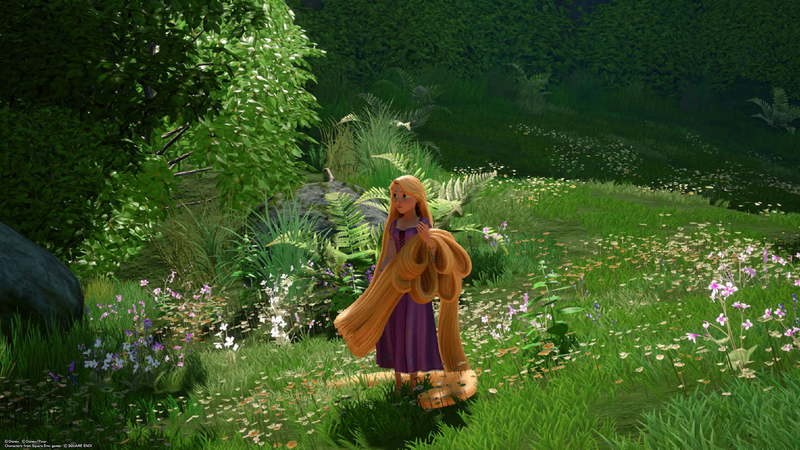 Tagged with Action,	Disney Interactive,	Microsoft,	PlayStation 4,	Reviews,	Role Playing Games,	Sony,	Square Enix,	Xbox One.